Congratulations to Dr. Sade Kosoko-Lasaki, Associate Vice Provost of Health Sciences and professor in Creighton University School of Medicine for receiving the Interdenominational Ministerial Alliance of the Metro Omaha Area (IMA) Drum Major Award for Accountability in celebration of Martin Luther King, Jr.
Every year, for the past 35 years, IMA has hosted the Martin Luther King Jr. unity service and luncheon in Omaha. In most recent history, “we have made it a point to recognize local efforts of individuals whose work embodies the legacy of Dr. King and that make his “dream” a reality,” says Rev. Tony Sanders, President of IMA. 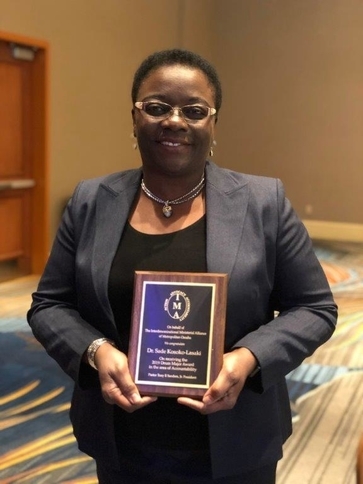 Dr. Kosoko-Lasaki’s commitment, contribution to the community and compassion toward those outside of herself, brought her name to the attention of IMA. 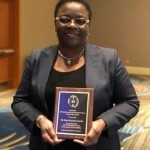 It is with great honor IMA has recognized Dr. Kosoko-Lasaki. Thank you for all of your hard work and sacrifice and thank you for accepting this award.